Tree Trimming: What Not To Do | Mr. Tree, Inc. Trees are beautiful additions to any home landscape. But owning a tree isn’t as simple as planting it and watering it a few times per year. Keeping a tree beautiful takes work. Tree trimming is a part of that process. Tree trimming is essential for a variety of reasons, from keeping the tree as healthy as possible, to ensure the safety of people around it. Dead or diseased branches can be dangerous for the tree’s overall well-being. And if a dead branch topples, it can put both people and property at risk. Crossed or co-dominant limbs can result in suffocating, constricted growth that can cause a tree quite a bit of harm, as its own branches compete for space. Heavy growth can block sunlight, interfere with power lines, or interfere with road traffic. If you want a healthy tree, regular maintenance is a part of the process. Yet there is a time and a place for proper tree trimming. If you trim back a tree at the wrong time of the year, you could end up damaging the root system and stunt its growth, for example. Yes, tree trimming needs to be a part of your normal home maintenance routine. But follow these few tips to ensure your tree remains safe in the process. It’ll reward you by being a healthy addition to your landscaping for years to come. Trimming during fall makes it difficult for trees as they head to their dormant natural state, and this is also the time of the year when decay-causing fungi and organisms are in the air. Fungal spores can spread quite rapidly and can be difficult to remove. Don’t trim trees in the hot, dry summer as the stress of having to promote growth in the heat can be detrimental to the tree’s health. Similarly, any trimming or pruning in the middle of a cold winter adds to the stress on the tree. trimmed only when its flowers start to fade. Before you pull out the pruning shears, ask yourself why you’re trimming your tree. Is it purely for aesthetic reasons? Proper care should be taken to not alter the natural shape of the tree beyond a sustainable point. Don’t trim your tree excessively, stripping it of the vital foliage that promotes a healthy balance. Make sure not to take off more than 25 percent of the foliage, as that would be harmful to the tree. Trimming healthy branches for the sake of aesthetics is inadvisable as well, as it can cause long-term damage to your tree. Consult professionals before taking any steps. Trimming with blunt or poor-quality tools is a definite no-no, as the damage caused to your tree can be irreversible. Don’t risk using hand saws for branches with a diameter less than an inch, or if at a height higher than your head. Avoid using climbing spikes and hedge shears on trees. If the trimming process will involve using a ladder, chainsaws and other heavy trimming equipment, use professional services such as Mr. Tree instead. Don’t use wound paint or any type of sealer to ‘heal’ the wounds. These can promote rot and moisture retention. Trees heal best through the natural means, hence should be left to their own devices post trimming. Unless there is a need, such as a tree sustains damage, avoid trimming a tree in its first year. At this young stage, the tree is also at its most vulnerable, and any unmanageable wounds can affect it for life. As mentioned previously, any flowering trees need to be in full bloom, with flowers starting to fade, before any trimming work should be conducted. Before you start trimming a tree, take a look around the perimeter to assess the safety factor of the project. If there is property like houses or cars, would a falling limb cause damage? If the tree is near a road, could trimming impact someone riding by? How many people may wander onto the property while you’re caring for the tree? Similarly, if the trimming will take places near utility lines like electricity lines or poles, then it needs to be handled by professionals. Any tree trimming work due to a storm can be extremely dangerous as branches could be broken or weak. It is best to stay clear of the trees to avoid injury and to call for professional help. Don’t cut the branch all the way to the trunk. Any cuts near the branch collar should leave the collar on the trunk of the tree. Conversely, don’t leave too long a stub. Take care to avoid any damage to the tree’s stem tissue due to improper cuts. If cutting a large branch, don’t cut the entire branch at once. This could destabilize the tree, weaken the bark and cause other damage when it comes off. Instead, opt into cut the branch in smaller sections – approximately a foot long. 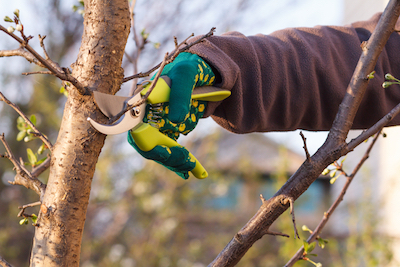 Avoid cutting strong branches with U-shaped angles. Instead, trim thinner branches with V-shaped angles. Do not remove more than 25 percent of a living crown in one go. If required to do so, make sure to spread this across a few years. Don’t cut too many branches near the bottom of a tree. Ideally, there should be live branches on two-thirds of a tree’s height. Trimming and pruning isn’t something to take on half-heartedly. Cutting the wrong limbs can impact the tree for a lifetime. Safety equipment while climbing anywhere is a must, and be prudent in keeping insurances up to date to protect your property against damage. If there is even a small percentage of risk involved to yourself, others, or to property, contact professional services at once. So, keep in mind all the things to NOT do while trimming, and look forward to a healthy, happy, beautiful tree!